So this is how it happened.. I bought some chicken tikka masala from king soopers (kroger) - I guess the marketplace has this frozen section of certain foods that you can put into a bucket and take home with you.. it includes chicken masala, shrimp scampi, mac & cheese, and a whole bunch of other foods so I decided to get some chicken tikka masala. Well, I didn't know what to eat with it cause I couldn't just eat it on its own, so I made some rice in my Instant Pot. Well, silly me forgot that 1 cup of rice = 1 gallon of rice after it's been cooked so I had a lot left over. I decided I should wing it at making some fried rice. I kinda sorta half listened to some videos on YouTube and winged the rest. I will tell you, it took me about 10 times before I perfected the recipe. (I'm not saying I made 10 batches that night, that would be crazy). But, I can successfully say that I did it! And for you, here is my recipe! :) If you make some, let me know so I can share! 1. Cook your rice and water until it's cooked. I like to have the rice ready before I start cooking the rest of my ingredients. I used my instant pot and it cooked in 12 minutes. If you don't have one, you can cook it over the stovetop & follow directions on the bag. 4. Once the chicken is about 50% cooked (should be about 2 to 3 minutes), add in your diced peas and carrots. 5. After about 2 to 3 minutes, add in your diced onions. 6. 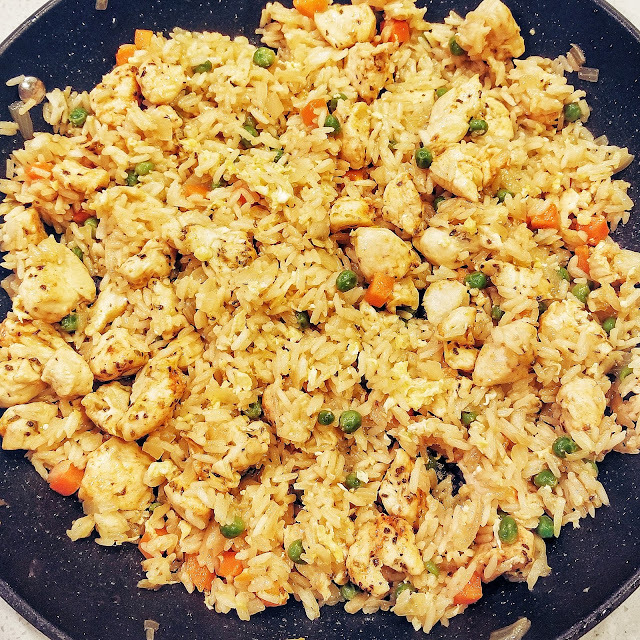 Once the onions are somewhat translucent and your chicken is fully cooked, add in your rice and mix in with all the ingredients. 7. Add in your soy sauce. I'm gonna be honest and say I just kinda wing it with the soy sauce. I just add in however much looks good. You can add 1 tablespoon but if you feel that it's not enough, you can certainly add more or less. Your choice! 8. Once that's all mixed in nicely, I use my wooden spoon and move all the rice and vegetables towards the outside of the pan, leaving a big hole in the middle - kinda like a donut. Crack one egg in the middle and start scrambling it. As the egg starts to cook more, mix it with all of your ingredients. 9. Keep mixing until all the ingredients are fully mixed and cooked through! Add in salt and pepper as you wish, or any other spices. 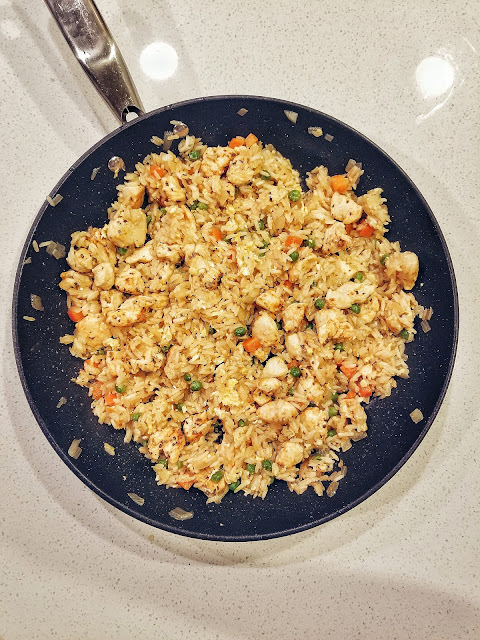 You can certainly add in any other ingredients that you like - celery, peppers, leave out peas - whatever you like because it's your fried rice and you can make it however you like!